New quiet exhaust fan unit has been designed for fitting into flight case racks and enclosures; especially where the back is enclosed and the hot air is not being expelled. These type of situations invariably cause thermal failure, as any in-boardfans are just recycling hot air. 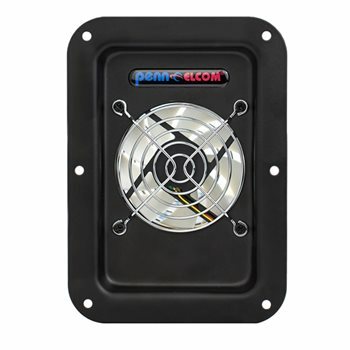 These exhaust fans are easily mounted into any style of flight case, using the same technique as fitting a socket or handle dish. They can be mounted in either horizontally or vertically. A thermal sensor accessory, the CRC-TEMP can be Plugged into the TEMP socket. It is set to operate at 40 degrees and will reset at 30 degrees, + or - 2 degrees. What is the maximum panel thickness that this exhaust fan will fit through?